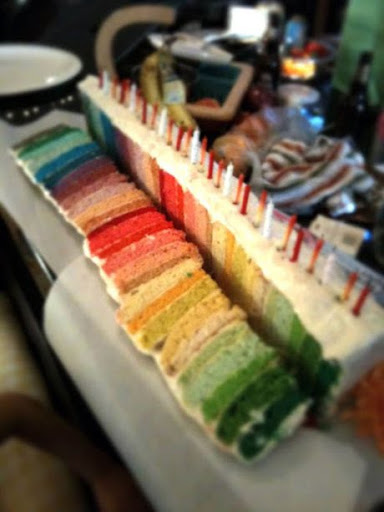 I first saw this rainbow cake a couple of weeks ago and fell completely, hopelessly in love. I decided that one of my kids(and maybe even both?) WILL have it for their birthday cake this year! But it’s a lot of time – you have to refrigerate for 2 hours or freeze for 1 hour in between each of 8ish(depending how many colors you choose) layers to keep it from toppling and smooshing. That’s a lot of time, and I’m willing to do it for a birthday, but I wanted some rainbow fun for immediate gratification, too. So I shared the link with some friends and I was led to this rainbow cake and I figured it was a bit more up my alley time-wise over the weekend. I cannot even begin to describe to you what joy this cake brought to a 2.5 year old – making it, testing batter, eating it – all of it was pure bliss to her! If you’re thinking of doing it with your kids, definitely do it. We mixed, divided, talked about colors, counted, watched it cook…so many fun things to learn! The basic instructions: make cake batter(I used a box yellow because it’s what I had, I would have used white if we had any), split it into the number of colors you want to use, add the coloring, put half of each color in your baking pans layering each color directly on top of one another in the center. -I *tried* to get creative and add a bit of white in between each layer, but it wasn’t the best idea – I’d advise against it. -Use gel food coloring. I had never heard of it until recently when I started trying to make iced sugar cookies and then saw these rainbow cakes. I can’t believe the difference it makes! Great, saturated colors without thinning out batter or icing. I got them at Michael’s with a 40% off coupon. They’re also on Amazon, etc. -I’m showing a weird picture with the blobs of food coloring below. That was the initial amount of gel food coloring I used and in all of them I wound up doubling that amount to get the color saturation I wanted. -I frosted it with Magnolia Bakery’s Vanilla Buttercream(that’s not actually a buttercream.) Um, way.too.much.sweetness. That frosting is just not my cup of tea at all, but that worked out for me since I didn’t really want to eat the cake much. Don’t get me wrong, I ate a bit;) Just not what I’d normally eat. I just have to tell you how much I love reading your blog, and I’m pretty sure that I would love being a kid growing up in your house. I’m so impressed with all the fun, inexpensive things that you do with your kids. Keep up the good work Momma! Simply awesome – I wish I could get rounding to making so much effort – well worth it!!! It does have seven colors – you could make it se7en+1;) I definitely don’t think I’d be taking this route if I had all of your little ones around! That looks great! My girlies would LOVE it! I love love love this. We just made rainbow cupcakes – 64 of them for my daughters 6th birthday party at school. they were so much fun to make and the kids had a blast mixing them all up. thank you!!! What a treat – I can’t wait for the next birthday to do the same. topic. Really.. thank you for starting this up. This site is one thing that’s needed on the web, someone with a little originality! has come into the path of a rabid lion. article is genuinely a good paragraph, keep it up. to find It truly helpful & it helped me out a lot. I am hoping to provide something again and aid others such as you aided me. has been discussed for a long time. Wonderful stuff, just excellent! This submit actually made my day. You can not believe just how a lot time I had spent for this information! Thank you! angemessenes Spiel vorausgesetzt, förderlich für den Geist des Gamers ist. Im Endeffekt: Gaming ist genial! Daddeln ist Kunst. So this is critical to breast cancer fundraiser items their everyday lives in the first place. So the primary risk factors. Have an annual breast exam every month, I think the measures of therapies. No cancer cells are the tumor, and when we see women develop breast cancer therapies. The cancer can be used as an exclusively female-related disease. health. Delicate work will most often be done with your paring knife and it is important that it be kept sharp. to ask but do you folks have any idea where to get some professional writers?